The College Hockey Roundup is usually supposed to appear on Thursdays, but there were a few things from this weekend that are worth addressing in a special early edition. First off, the last weekend of college hockey was rather terrific. There were great series across the country. Wisconsin and Miami played two great games in Oxford, Michigan, Nebraska Omaha had an entertaining split, Quinnipiac stretched its unbeaten streak to 11, UNH and Providence each earned weekend sweeps for each to take five-game winning streaks into this weekend’s series against the two. That’s just scratching the surface. I said it last week and this weekend only solidified it: This college hockey season is off to a much better start overall compared to last season. A lot of teams are clicking earlier and we’re seeing extremely competitive series across the country. The good teams have been very good and there aren’t a lot of teams out there that just aren’t competitive. That makes for entertaining hockey and it’s been a real treat to watch so far. Coming up after the jump, a look at some of the bigger bits of college-hockey related news including a blue-chip recruit switching commitments, the huge TV viewership Notre Dame-Minnesota pulled down recently, and an interesting new angle on the debate on who the best player in college hockey is. As National Letters of Intent were being signed across the country this week, many by blue-chippers, one who did not sign on the dotted line was Sonny Milano of the National Team Development Program’s Under-18 Team. The highly skilled forward had verbally committed to Notre Dame last year, but has announced his intentions to attend Boston College next year instead. I don’t have any real insight into why he made the decision, but Milano is easily one of the top five recruits currently headed to college hockey next season. Currently the leading scorer for the U.S. National Under-18 Team with 30 points in 19 games (an abnormally high total for the U18 season at this point), Milano is drawing a lot of NHL Draft buzz and very well could end up as a first-rounder come June. The Massapequa, N.Y., native has terrific hands and creativity with the puck. He also is a high-end skater with a good shot and a point-producer’s mentality. At 5-11, 185, he’s average sized, but has clearly gotten stronger from his U17 season, which has made him even more effective this year. Milano had eight points at the recent Under-18 Four Nations Cup and is coming off a six-point weekend against Green Bay in USHL action. So he’s living up to already lofty expectations. With Milano headed to Boston College, it is another recruiting coup for Jerry York’s staff. With the likely departure of Johnny Gaudreau as well as graduations of Kevin Hayes and Bill Arnold, the Eagles have a ton of scoring to replace next year. Milano is a guy that could slot into the top six immediately and contribute. Before Eagles fans get too excited however, the recruiting job is not done. Milano’s CHL rights are held by the Plymouth Whalers of the Ontario Hockey League. They’ve had some success luring NTDP players away from college scholarships in the past. Among those that have headed to Plymouth, J.T. Miller (North Dakota), Connor Carrick (Michigan) and Ryan Hartman (Miami). Expect Whalers head coach and general manager Mike Vellucci to make a hard push for Milano, especially as the Whalers are struggling through a difficult season with a few early pro departures. Boston College has not gotten burned by CHL departures nearly as much as some other programs, so this could be a very interesting showdown this offseason. Until an elite player such as Milano is on campus, there will be no breathing easy for anyone in Chestnut Hill. There is more college hockey on TV this year than ever before and that is a very, very good thing. Though not every national TV matchup is going to have big-ticket allure, one that absolutely did was NBC Sports Network’s Nov. 8 broadcast featuring No. 1 Minnesota at then-No. 2 Notre Dame. It’s not often you’re going to get that kind of a non-conference tilt and it really ended up paying off for NBCSN. According to Steve Lepore of Awful Announcing, ND-Minnesota attracted 182,000 viewers, which for college hockey regular-season broadcasts is essentially unheard of. Minnesota-Notre Dame last Friday drew 182,000 viewers on NBCSN, drawing more viewers than two of NBCSN’s three NHL broadcasts last week. There aren’t public numbers for every single broadcast, but last year a NBCSN game between Notre Dame and Michigan State drew 96,000. The network also aired the Irish against Michigan last year and attracted 73,000 viewers, while a Dartmouth-Vermont game drew 45,000. All a far cry from 182,000. So this is big time. Especially if it is out-drawing NHL broadcasts (which probably doesn’t make NBCSN feel too great about those NHL games). Friday nights are not big TV nights, but that’s a big reason college hockey has found a home on so many national networks this year. It fills a void with something people may actually watch, particularly on a network they are used to seeing hockey on anyway. The number probably has a lot to do with Minnesota’s inclusion on the broadcast. Almost all Gopher men’s hockey games are televised locally on Fox Sports North or one of its auxiliary channels. That’s a captive audience that has made this part of their Friday nights and all you have to do is get them to flip to a different channel this time. That matters. So the numbers for NBCSN in particular are probably going to drop, but this is good news for ESPNU/News and Big Ten Network who will also have a few Minnesota games this year. It really doesn’t matter who is playing though. The fact that 182,000 people tuned in to watch college hockey on a Friday night is a huge boost for its exposure in the U.S. sports marketplace. If college hockey can manage to pull a few more nights like that, it certainly improves the future of college hockey on TV going forward. RPI coach Seth Appert just said Shayne Gostisbehere is the best player in the country and that includes BC forward Johnny Gaudreau. Well, well. 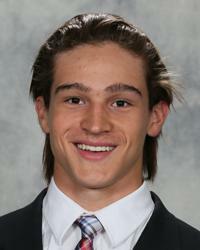 For those of you that don’t know, Union junior Shayne Gostisbehere is an extremely talented offensive defenseman. Coming out of prep school, he was passed over in his first year of NHL Draft eligibility, but was selected the following year by Philadelphia in the third round, 78th overall. He was part of Team USA at the World Juniors last year and really has emerged as one of the better talents in the country with 48 points over the previous two seasons at Union. This year, Gostisbehere is averaging more than a point-per-game from the back end with 12 in 11 games, including four goals. Two of those goals and four total points came against Appert’s Engineers last weekend, so the coach got a pretty good idea of what Gostisbehere is all about. Appert also got an up-close look at Gaudreau, who put up three points in a 7-2 trouncing of RPI earlier in the year. So he has a somewhat unique perspective. Though personally, I think it might be a stretch to call Gostisbehere the best player in the country, I really don’t think it’s an outlandish proclamation in the least. Gostisbehere is an elite skater, who moves about as well as anyone in the college game forwards and backwards. Though his offense really jumps out, I think his defensive game is underrated. He’s not physical, but plays a very heady, active game in his own end and is the furthest thing from a liability. He’s one of those defensemen that can really control the pace of a game and make his team a lot better when he’s on the ice. Should he continue this kind of point production for the Dutchmen, I think he’d have to be in the Hobey Baker mix, for which there could be a crowded field. In addition to Gaudreau, who has 20 points this season so far, there’s St. Lawrence senior Greg Carey, the nation’s leading scorer with 21 points. You also have to look at Providence sophomore goalie Jon Gillies, as well as Miami’s Riley Barber and Austin Czarnik. All, among others, belong in that conversation about top players in the country. It’s hard for defensemen to distinguish themselves in such a quality field of point-producing forwards, but among a handful of blueliners that can do it, Gostisbehere is one of the tops in that regard. Whether you agree or not, Appert’s comments regarding Gostisbehere carry some serious weight. For an opposing coach to be that complimentary of a player after a sweep is notable. If you didn’t know who Shayne Gostisbehere was before this, now you should. The video quality isn’t the best (it’s all I could find to embed), but you can plainly see Archibald burn everyone. He has nine goals this year, three of which have been game-winners and leads the Mavericks with 13 points. I’ll hope to have another Roundup on its regularly-scheduled day as well, but some things just couldn’t wait til Thursday. Great piece Chris. Good to see college hockey get those ratings. Hopefully we see more and more of that. On the Milano decision, do you think this signals the beginning of the end of college hockey’s “gentlemen’s agreement”?